The third year of our ERC-funded project PERFECT (logo above) has just started and it is time to look back at what we have done in the last year, and make plans for the future. The PERFECT team delivered many academic and outreach talks in the UK and internationally, wrote papers, and organised a series of interdisciplinary events sponsored by the project, including a mini-workshop on Belief and Emotion in November 2015, a public engagement event called Tricked by Memory for the Arts and Science Festival in March 2016, and a symposium entitled Explaining Delusions at the International Congress of Psychology in Yokohama in July 2016. The main event was our first project workshop, PERFECT 2016, on False but Useful Beliefs, in February 2016. We had several papers accepted which will be published open access, including Ema's "Malfunction Defended" in Synthese; a chapter on what makes beliefs delusional by Rachel Gunn, Ema and myself, in the volume Cognitive Confusions: Dreams, Delusions and Illusions in Early Modern Culture, published by Legenda; and a chapter on gradualism in psychiatry, illustrated via the case of delusions, by Ema, Matteo Mameli, Matthew Broome and myself, to appear in the volume Vagueness in Psychiatry: Gradualist Approaches to Mental Health and Disease, published by Oxford University Press. We continued to disseminate our work on the blog, on the Imperfect Cognitions playlist on YouTube, and on an app for iOS and Android, called PERFECT, free to download. 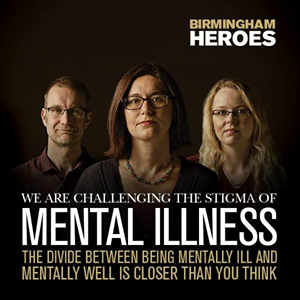 I was featured with Michael and Ema in the Birmingham Heroes campaign in November 2015, due to our commitment to address key issues relevant to the stigmatisation of mental health, and wrote two Birmingham Briefs on relevant themes, "Them and Us" no longer: mental health concerns us all and Mental health care is still awaiting its revolution. I also participated with Richard Bentall in an episode of the Philosofa podcast where I discussed the theoretical basis for rejecting the stigmatisation of psychological distress, namely the fact that there is no clear line between mental health and mental illness. The rest of the PERFECT team (Kathy, Sophie, Andrea, Magdalena and Valeria) will tell you about their own plans in the next few Tuesday blog posts. I will say something about mine here. In 2015-2016 I have worked on the benefits of unrealistically optimistic and self-enhancing beliefs, and I started reading and thinking more systematically about confabulated explanations of one's own attitudes and choices. After thinking about epistemic innocence in different contexts, such as delusions, non-delusional irrational beliefs, clinical and non-clinical memory distortions, and explanations involving confabulation, I want to tie the loose ends and dedicate most of this academic year, 2016-2017, to preparing a book-length investigation of epistemic innocence, and I plan to spend some time developing and defending the notion. We call epistemically innocent those cognitions that have obvious epistemic faults, but also significant epistemic benefits that could not be attained otherwise. But how difficult is it to obtain this form of innocence? Should the formulation of epistemic innocence vary depending on the type of cognitions it applies to or the population adopting those cognitions? Why should it matter whether a cognition is epistemically innocent? In what ways does epistemic innocence differ from epistemic justification? What are its implications within and beyond epistemology? I can barely wait for a new exciting year of PERFECT and I hope you will continue to follow our progress and give us your valuable feedback through the blog, the Facebook page, Twitter and the app!